Do you have a passion for one in particular, is there a personal tie? My passion for LGBT issues stems from having many gay and lesbian friends and clients- and also a core belief that every human being deserves the same rights as another. There should never be a "separate but equal" set of standards and liberties. Is there a particular way you would want to encourage readers to be involved? Encourage your local law makers to vote for change by email, phone, letters, etc. Be more involved with your own community, and just pay attention to what's happening in our government. How would you define social responsibility? That's a really hard idea for me to put into words- but I think that you have to think of yourself as part of a whole instead of an individual. Don't get me wrong, I'm all for being your own person. But we all have to remember that our society won't make it unless we do it together. We can't selfishly work for only our own gain- we have to all be on the same team. If I have the right to marry any man I please, then it's my duty to make sure that the person next to me gets that same right- man or woman. And if they don’t, it's my responsibility to help fight towards that goal. 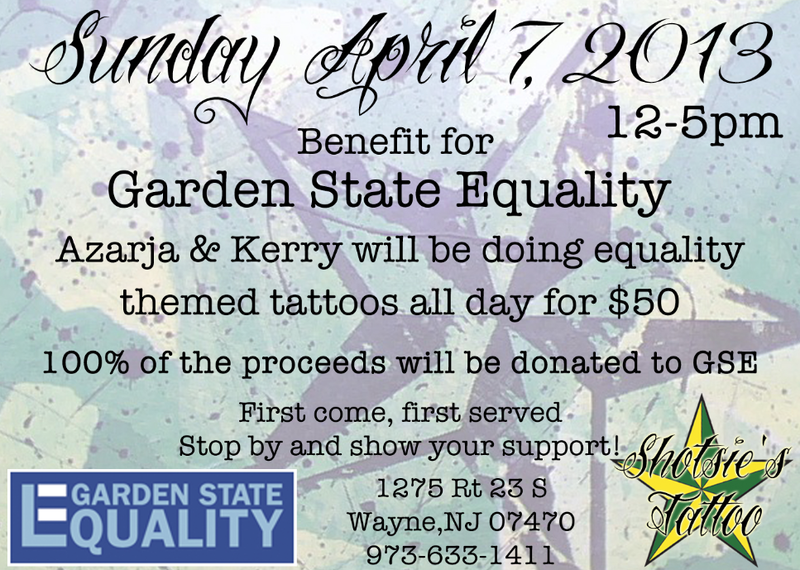 Do you have any tattoos that relate to your social beliefs? 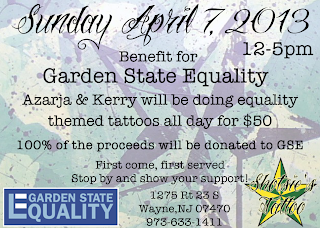 I don't, but I plan on getting an equal sign tattooed on me during our fundraiser on Sunday. Quick list of tattoos/mention artists if you’d like: I have a lot! Everyone at Shotsie's Tattoo has worked on me as well as Tony Ciavarro, Joe Capobianco, Craig Driscoll, Greg D. and Matt Lukesh. I love that you donate your time and talent to causes like this one - this is a very awesome thing to do.